Cycle. 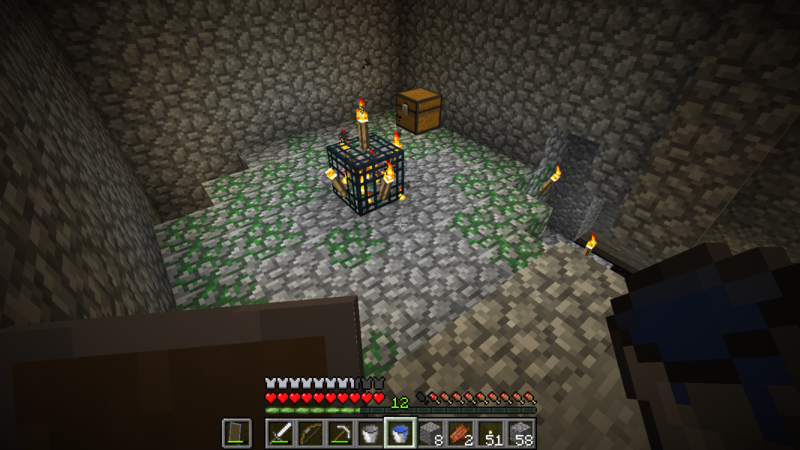 I fenced mine in, with torches on the fenceposts (in addition to the ones already on the ground)... The fences also kept mobs out, and kept the baby turtles in - i had a 5x5 pen, half beach half water. I deleted the lighting and the eggs started to crack shortly afterwards, but as i found out later they take a long time to hatch anyway, I wasn't sure whether deleting the light had made a difference. I also didn't consider what the baby turtles would do once hatched; when the first (and only so far) one hatched, it squeaked then proceeded to swim off at breakneck speed; I lost it within a few seconds! So now the rest are enclosed in an outer wall, at some point, i will have to design & build (or copy from YT) a small hatchery. 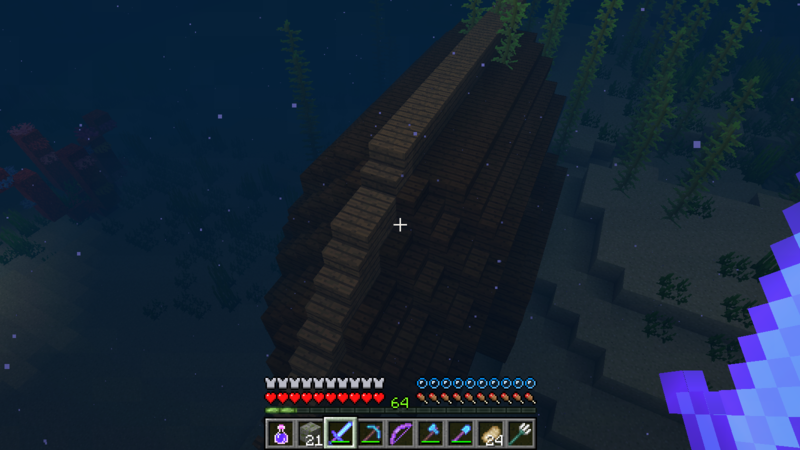 In my main world of 7 & 1/2 years+, I have just finished fencing off (By that I mean log posts with planks between them as "panels" not fencing fencing) a really ugly chunk border near Mount DOOOooom, and found a nice little surprise at the beach where I started. I've been digging it out properly today and made a bit of a farm/grinder from it, manual though nothing automated or afk. Spent a while grinding to get bones/bonemeal to make bone blocks and do a little decorative entrance, it's great for getting XP up, especially when a whole bunch of skeletons cram up at where I stand to attack them. Soon I will be flattening the area, once I move my beacon again which is temporarily at the Chunk Plaza giving that Haste II goodness. 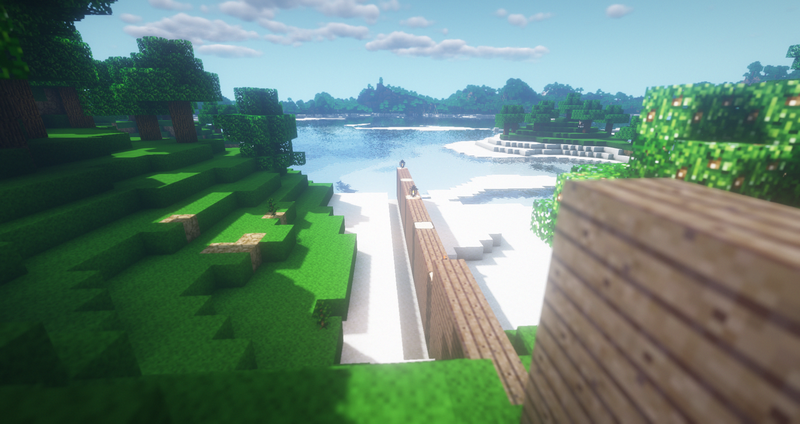 This will be so the flat side of the chunk wall facing out to sea can be made visually more enhancing. 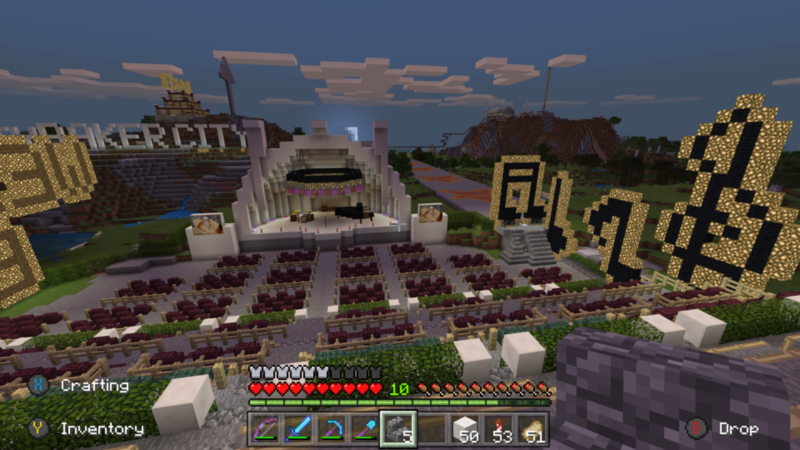 Just added some more detail to my Hollywood Bowl creation. 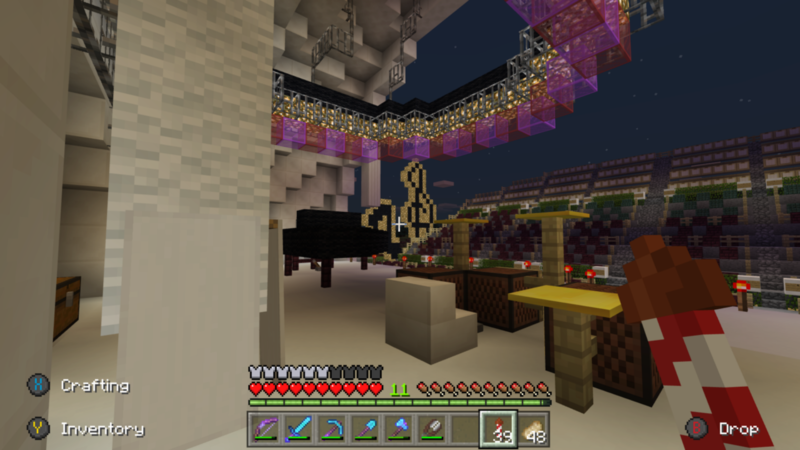 Now has a piano, drum set, backstage curtains and some cool music note pixel art. So I had an issue with Charged Aura Nodes in Thaumcraft 4.2.3.5 apparently not working (no brightening of the beams to the Vis Relays when approaching them while holding a wand that needed recharging), and attempted to correct it by restoring my last backup, which was 7/19/2017. When that did not work, I tried going back again to the current save, only to find it would not work at all. 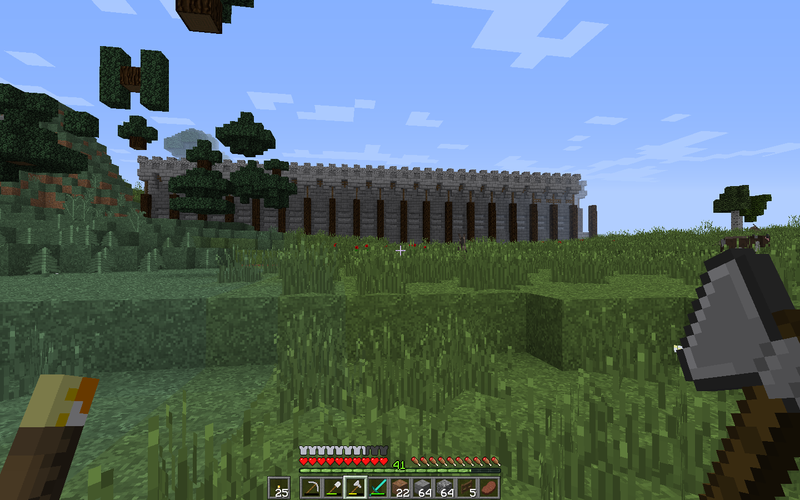 So the villager houses, my high speed rail line to the new base, and the walls I had built there, as well as some progress in the Twilight Forest, were now gone. 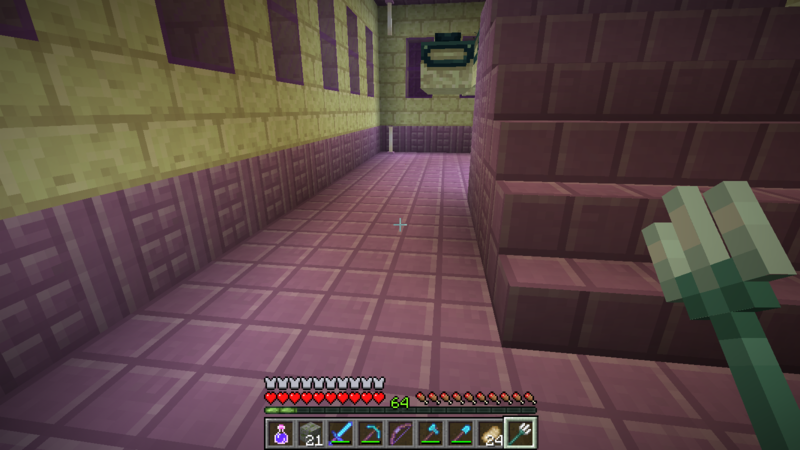 Inside my base, there was no longer the armors being displayed. I'm thinking of giving up on the 1.7.10 version and playing the latest Direwolf20 modpack on 1.12 (which includes quite a few new mods, and the return of some well known older ones, like Thaumcraft 6). 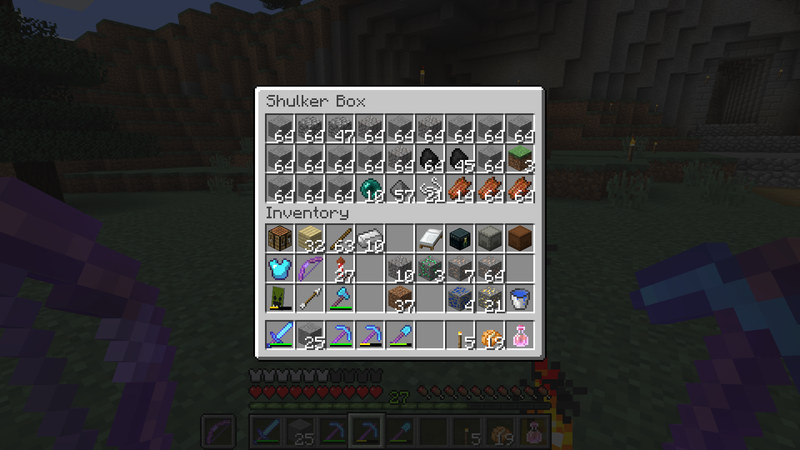 Forgot to add: I got the Seeker Bow from the Snow Queen. 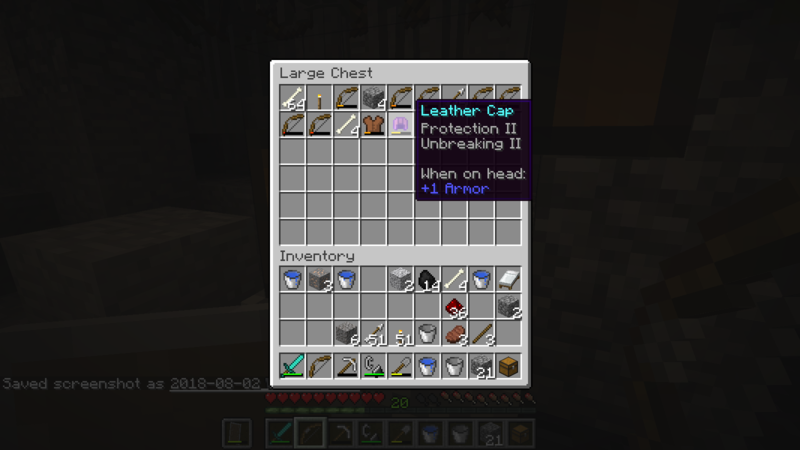 I might consider enchanting it as its homing ability might be useful, though I dont' really need it as I have a Flux-Infused Bow (from the Redstone Arsenal mod) I made some time ago. 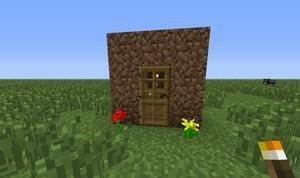 Now that I have made the first room of my base, I have decided to start with 1.13. 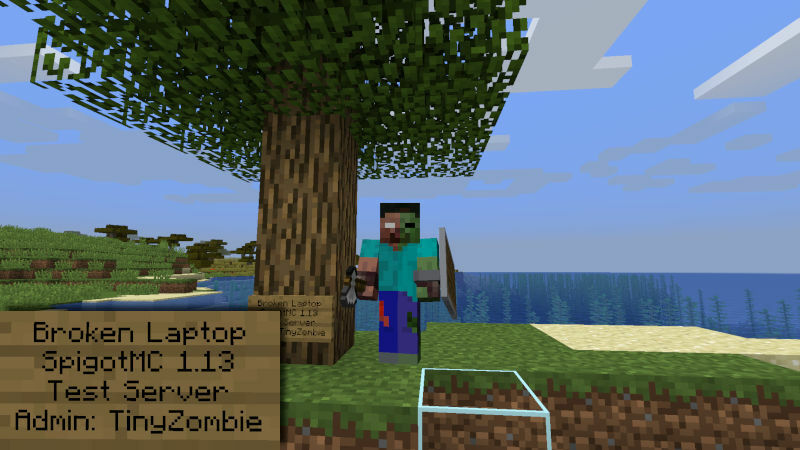 First, I'm not in 1.13, but in Snapshot 18w30a. Out of Screenshots, I've been preparing things and I've got my first Trident. 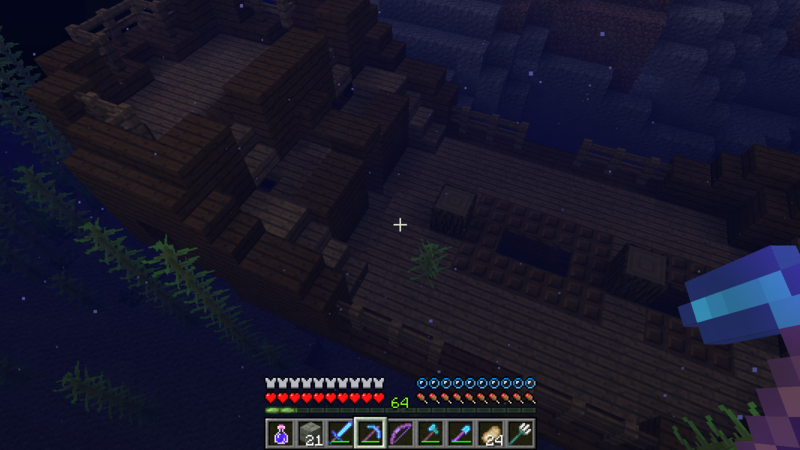 I have gone to a ship to look for some treasure map. In the second there was nothing either. In the third, if there was a treasure map. 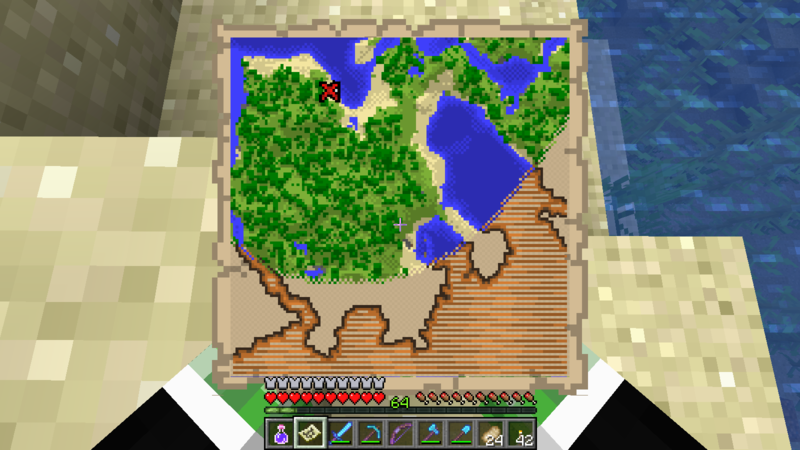 After looking for the treasure, I found the point where it was. I thought I was in the sea, but I was on the coast. 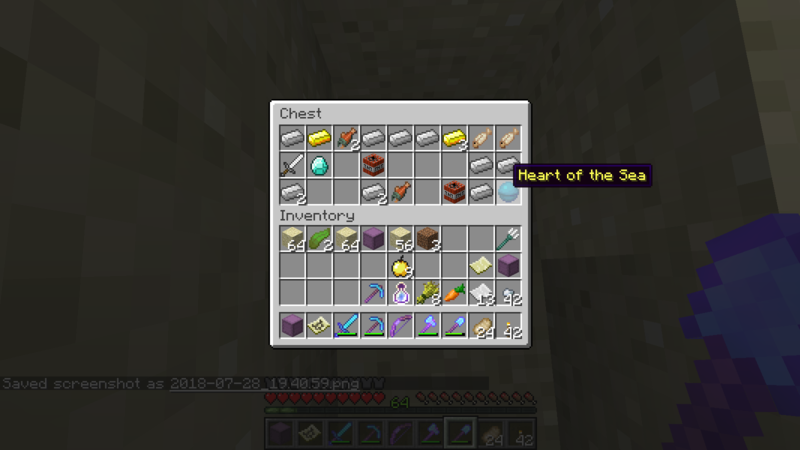 And so, for the first time I got a Heart of Sea. I'm sorry because in this week I did not say anything about my Survival. I was on vacation, and I could not talk about the Survival, but in August I'll be back with more projects. 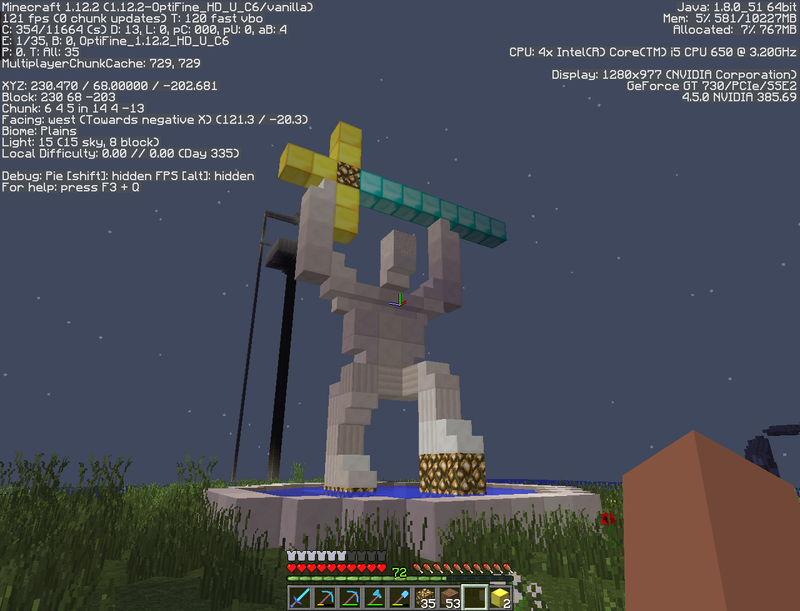 When I seek respite from whatever it is I'm doing in Minecraft, I'll fire up the old rocket booster and take to the air. Sometimes, I'll just sightsee. 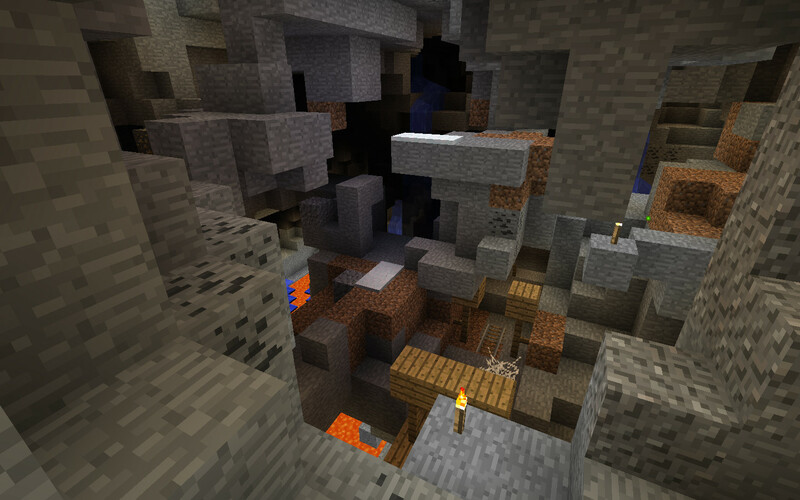 Other times, I'll land near my main base and delve into a cave or ravine. Yet other times, I'll soar across the sky for 10 or 15 minutes at least, travelling tens of thousands of blocks before returning home. It was on such an occasion that I flew to an old, well-explored ravine very close to my first and main base, Castle Midgard. 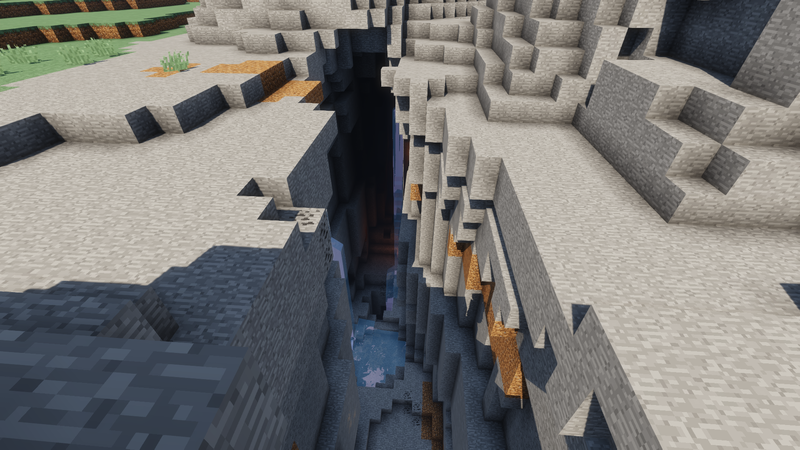 It's a deep, dark crevasse that I first discovered while following a drifting eye of Ender as it made its way toward the world's first stronghold not far from the castle. Well, not far by my current reckoning. 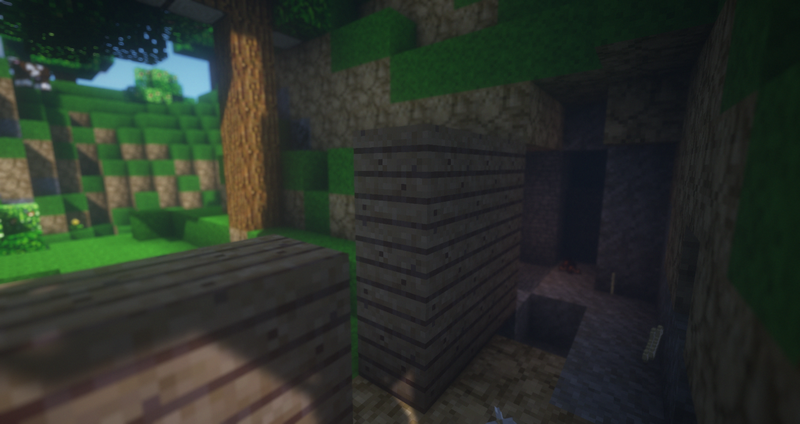 Back in version 1.7.10—back when I knew very little about Minecraft, back when the world was a vast and mysterious place, back when my render distance was less than half what it is now at 32—back then, this felt a whole lot farther away from home. I name a lot of locations, but there's nothing particularly significant about this ravine. 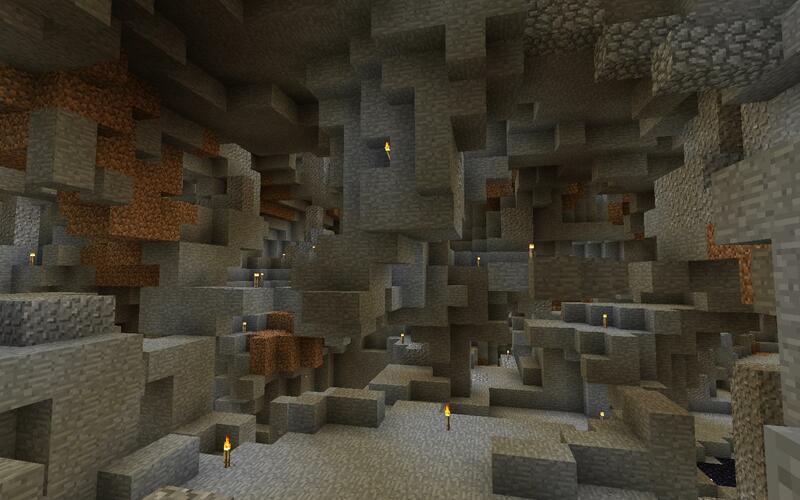 It's medium sized in length, but cuts fairly deep into the surface of the extreme hills biome. 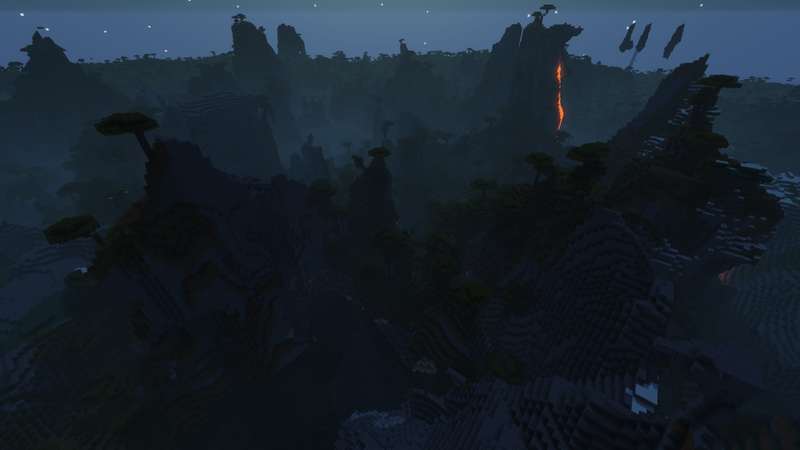 Honestly, I didn't really explore it for the first couple years because, well, it's just another ravine. It does have one feature that sets it apart, though: a black hole in its floor with a waterfall flowing down into it. That's a great place to start an adventure, and that's what I did several times over the course of the next couple years leading to today. 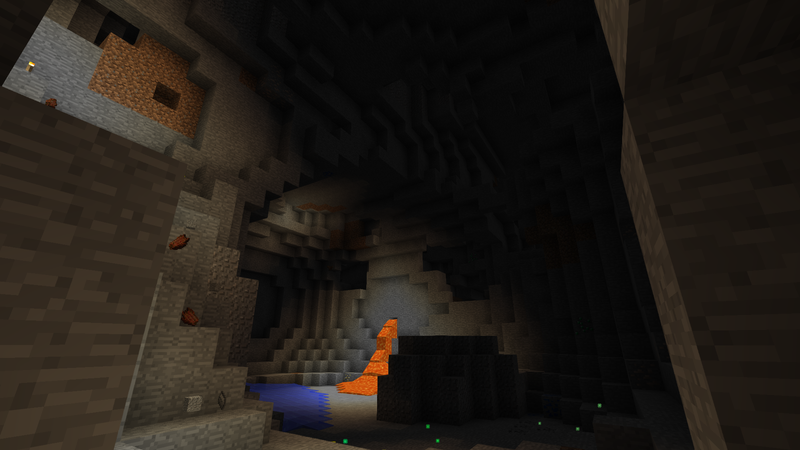 I like to leave my caves well lit enough to see, but not so well lit there are no shadows here and there for monsters to spawn. 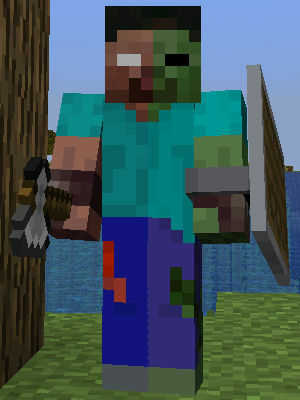 With max-enchant diamond armor, sword and bow, the monsters of Minecraft offer little threat—but sometimes things get a bit out of control. Not long ago, while still suffering from a poison potion tossed by a witch, a creeper exploded behind me, throwing me down into the lava at the bottom of a ravine for a ring of skeletons to pelt me from all directions. That's a situation. It's rare, but it can happen. All that to say, despite having god-tier equipment, on rare occasions, danger can still arise. No screenshots, but tonight I took a little break from the grind and took a short flight. 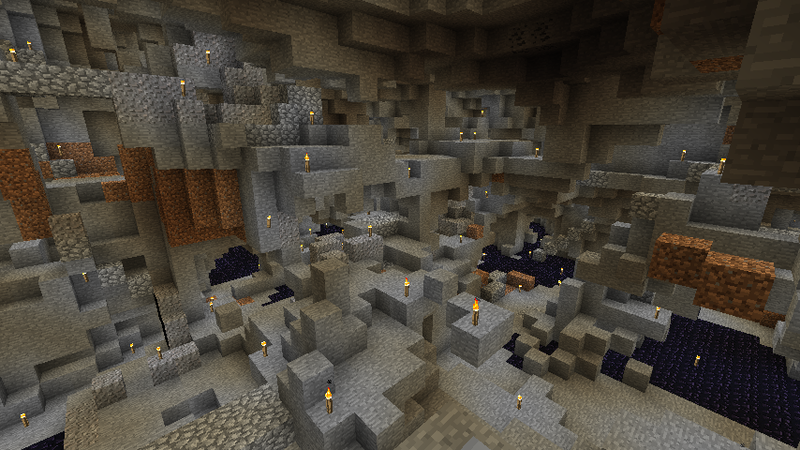 I saw the ravine and figured I'd explore the chasm in its floor. 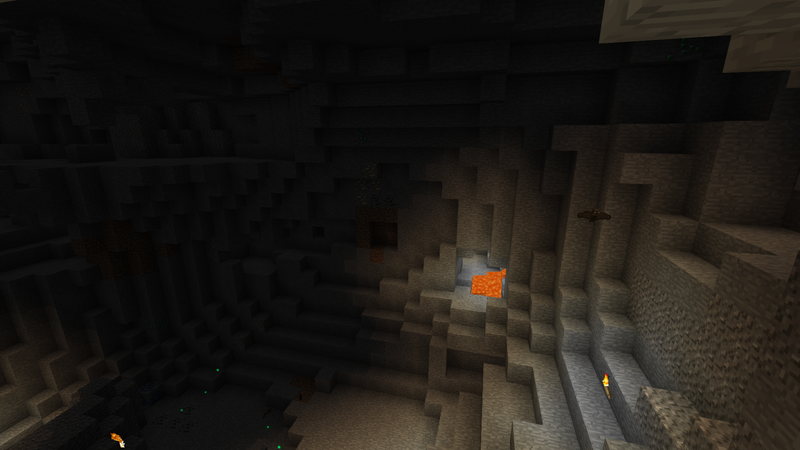 So, I flew down and then rocketed straight up to about cloud level, the hole directly below me. In mid air, I then swapped my wings for armor and plummeted some 150 meters or so back down. Death was certainly possible, but I expected to land in the water. I did, but I was going so fast that I crashed through the water onto the jagged rocks of the spillway and tumbled into a small pit. It was pitch black, of course, with no way to climb out. I couldn't really see anything and it all happened in a second. 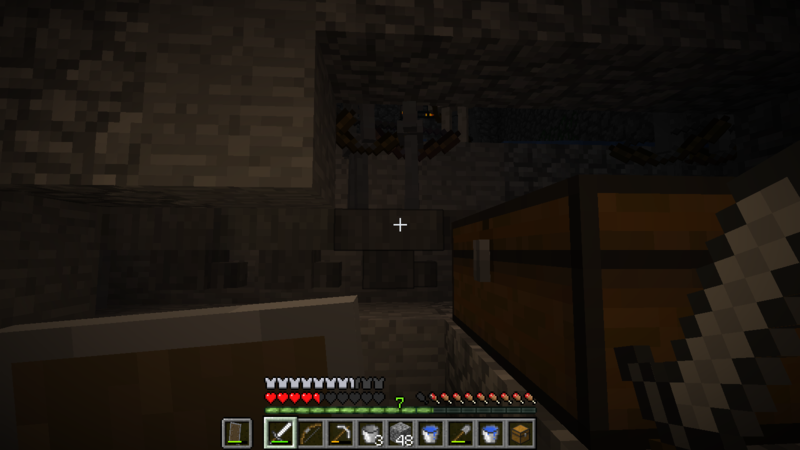 Thankfully, there was a creeper there to greet me, so I wasn't lonely. With a loud blast, he called in a party of about half a dozen zombies. As I chopped frantically in the dark, I had to laugh, "Were you all just waiting down here for me to arrive?" Soon, I managed to crawl out of the hole, covered in zombie gore. I had more than 20 rotten flesh, if that's a metric. I was battered, but still at more than half hearts. But, I was in a place that I had never been. 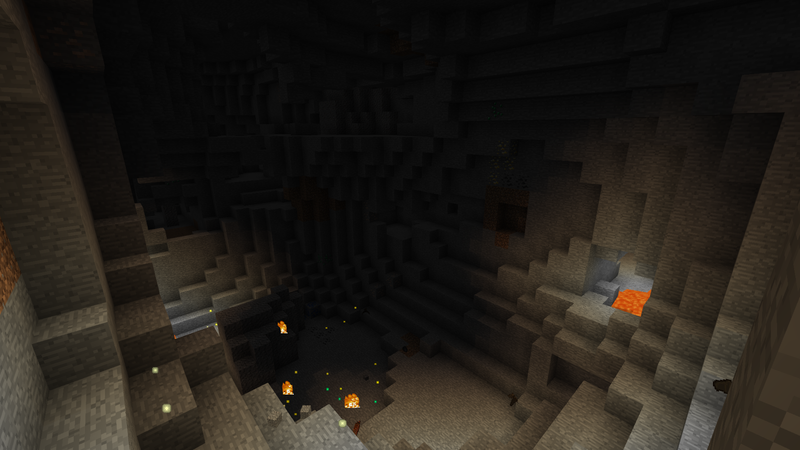 It was a dark cave leading toward light, but I soon discovered that was a lava gout, not a torch. 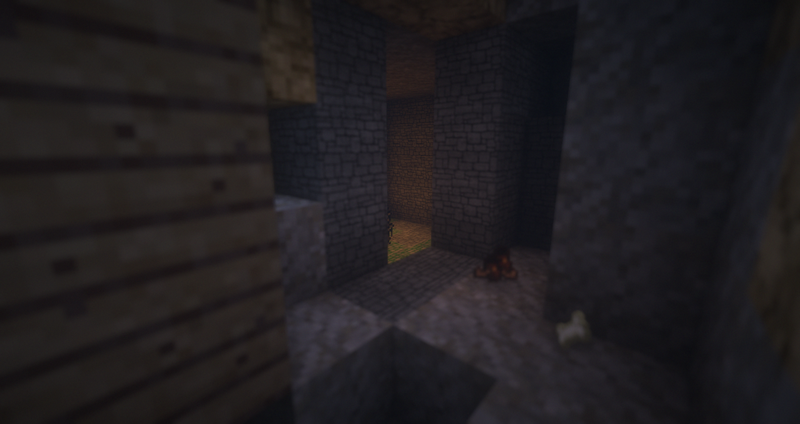 The was a nearby vein of gold beside a glittering emerald ore, so I knew this was an unexplored tunnel. 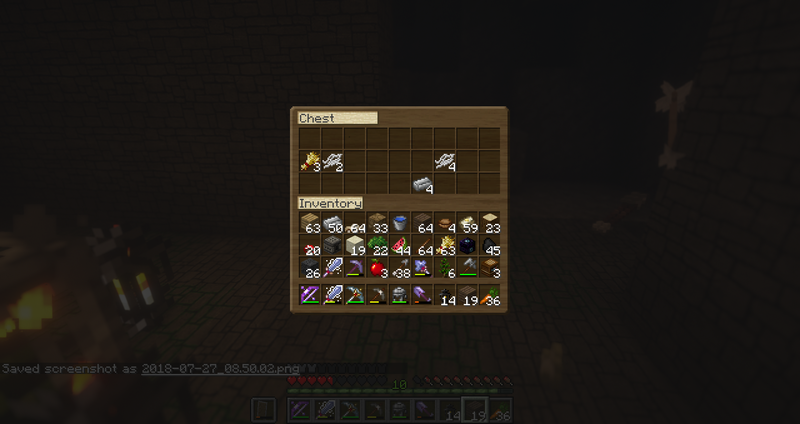 I mined for a bit then continued until I reached a ledge. 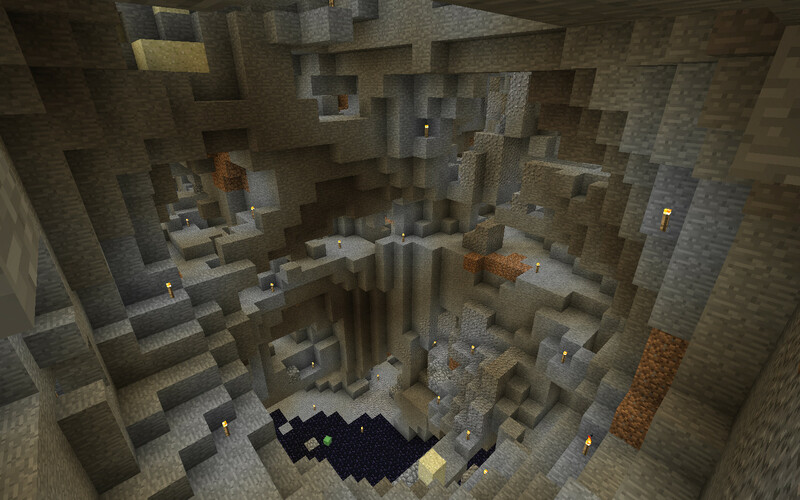 I looked out and saw a massive cavern expanding below me, big by comparison to any I'd seen, even some of the 1.6.4 stuff I recall (there's TheMasterCaver's dog whistle ). 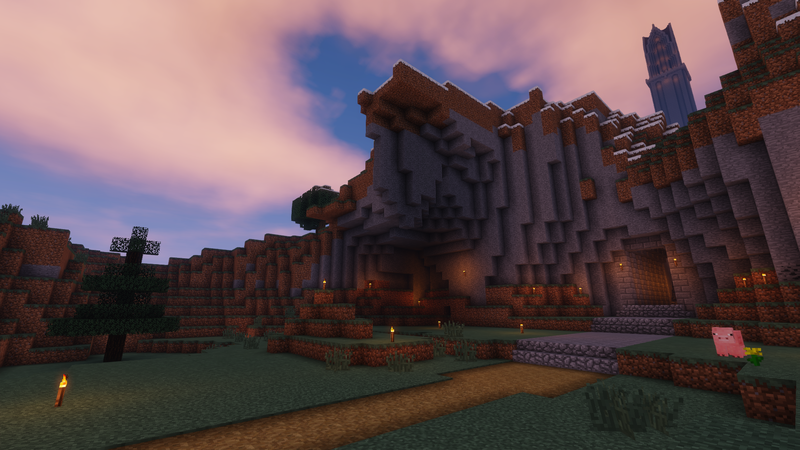 It may not be the biggest cave in Midgard, but it's right up there. Top five for sure. I snapped some pictures and called it a night. As usual, the pictures don't do cave size any justice. I turned my brightness up from the default where I always leave it to "bright" just for the pictures. All pictures are of the same chamber, just taken from different spots. 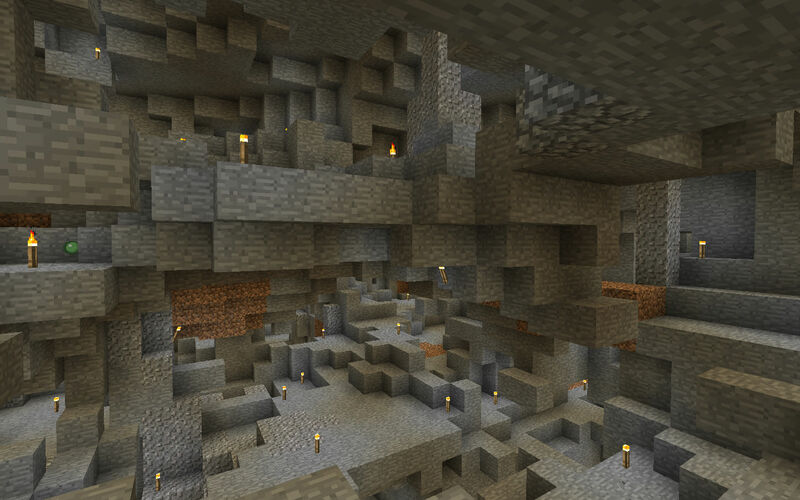 When I talk about "big caves" in 1.6.4 I'm referring to entire cave systems, not individual caves, which were not changed (the largest single cave can reach up to 27 blocks in diameter and get up to 84 blocks long before branching, with branches always being 4-5 blocks wide. 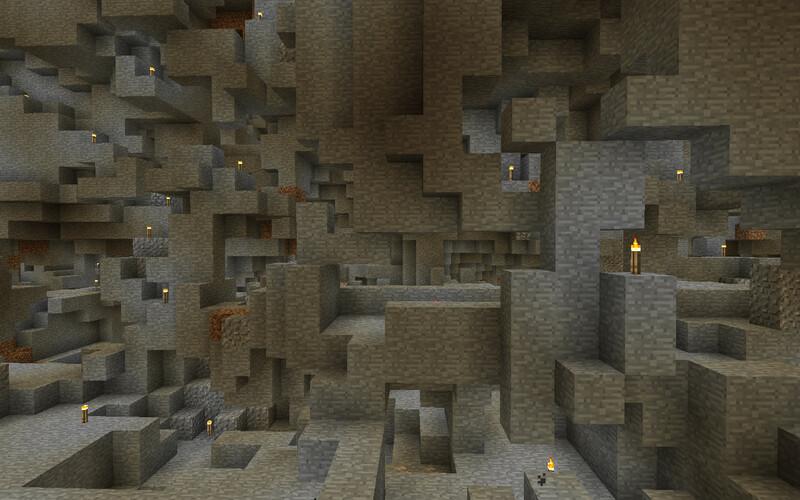 Even wider chambers can form if the cave loops around on itself, I've found some more than 30 blocks wide), and are also only slightly less common since the changes in 1.7 mainly involved the way individual caves are distributed. 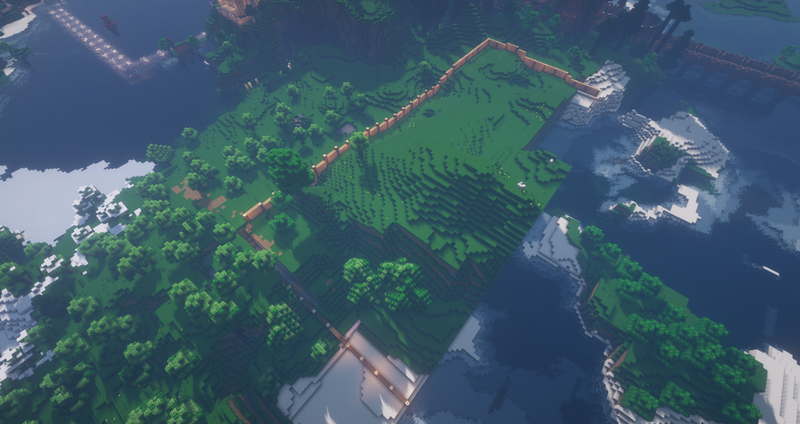 Waiting for Optifine for 1.13 to get finished so I started a brand new world yesterday which I will carry over to 1.13 once Optifine is finished for it. I rarely take time to build houses, most of the time they're just wooden blocks, so I'm very proud of this one I bulit over a couple hours last night. 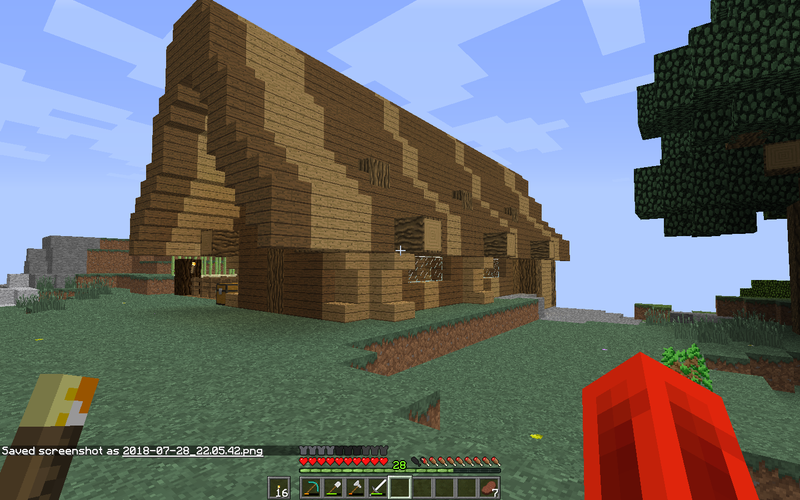 I wanted it to resemble an old viking longhouse but I think the roof came out a little derpy but I still like it. Come check out my youtube channel, I try to make it a pretty chill place! As always, the first view of home after a long 'splore is always a welcome sight; usually I approach the house by water, but this time I decided to just run up and over the mountain instead of rowing around. Love that map room pykaxe! I'm a big fan myself of using Acacia and Dark Oak together as they contrast each other so well. Boy, isn't that the truth! Great post, Pykaxe! I didn't think I'd ever noticed your posts before, but I looked back through you history and see we've conversed briefly in the past. You must take extended breaks like I do. I play Minecraft for about six months, then take a six-month break every year since I started playing sometime before the Horse Update. When did you start this world? 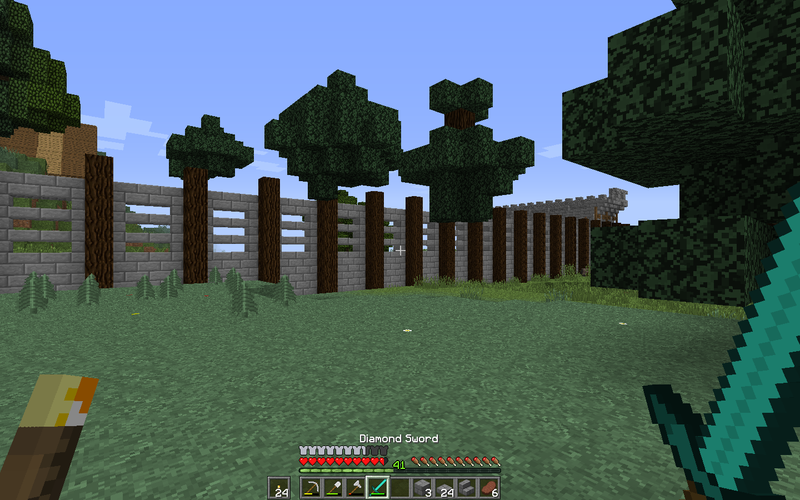 Spent all day today just building a large wall that will go around the front of my little house. It's taken me quite a few hours just to get the first half done, but at least Im starting to be able to see the end. 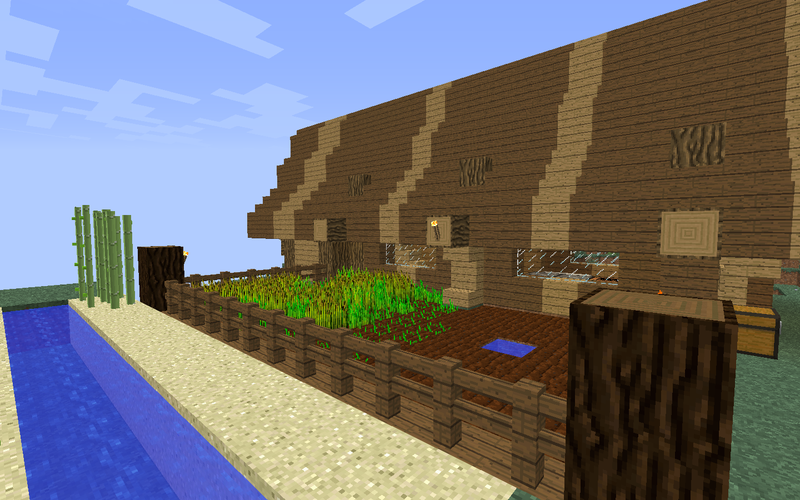 I was working on making a barn and a farm, but since seeing yours I would rather keep it private. Not sure if it's really worth posting, but here's a small update to my little cave adventure . . .
To my surprise, the rest of the caving was very refreshing; a lot of combat in a cavern system that had interesting generation features like large chambers, overhangs, natural bridges, intersections with ravines, lava layer excitement, etc. 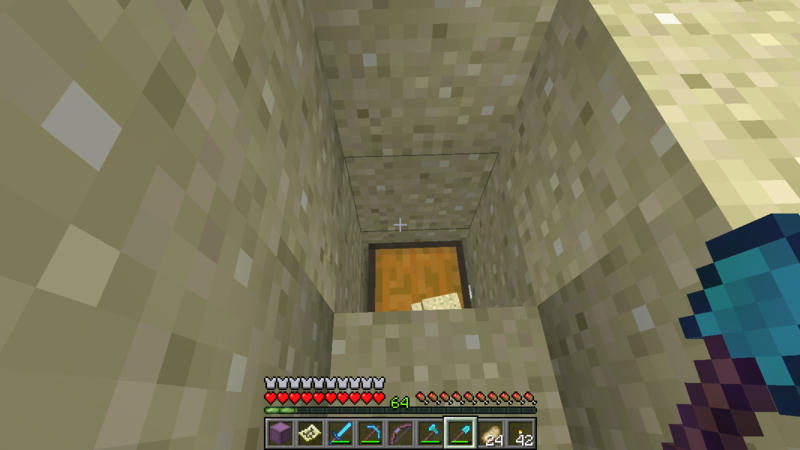 Sadly, no diamonds, but I wasn't seeking anything other than adventure, and that I received in spades. I filled up a skulker with junk and decided to head back to the surface. 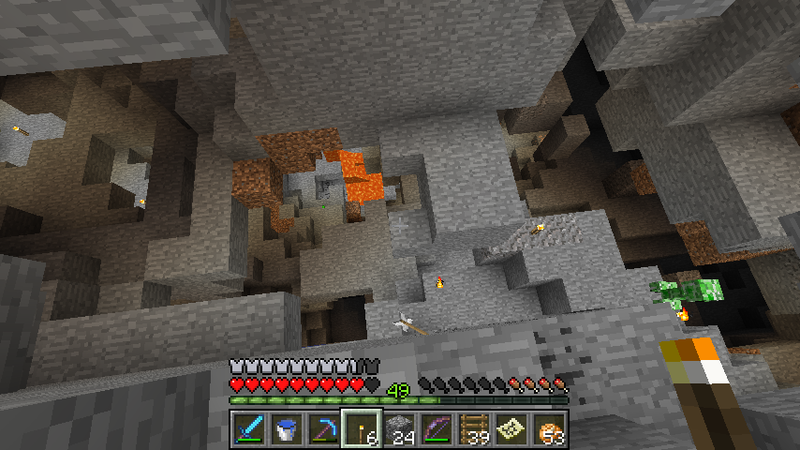 Like I say, I wasn't mining, so my usual "adventure until you find diamonds" approach didn't apply. 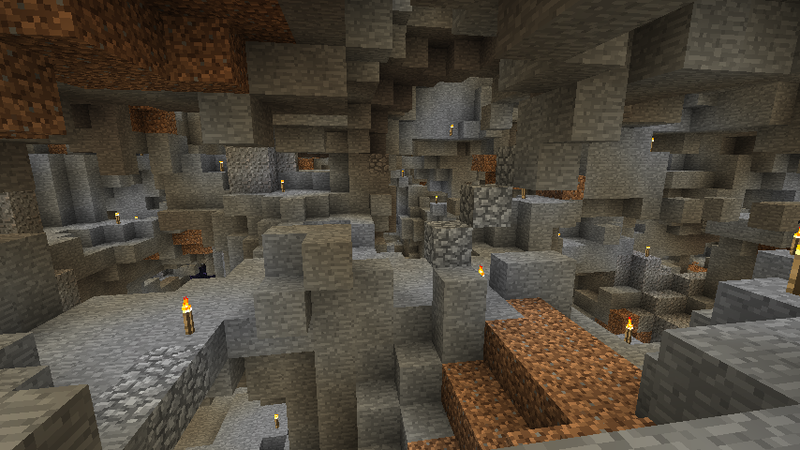 I left lots of ore including all of the ore from the cave screenshots. 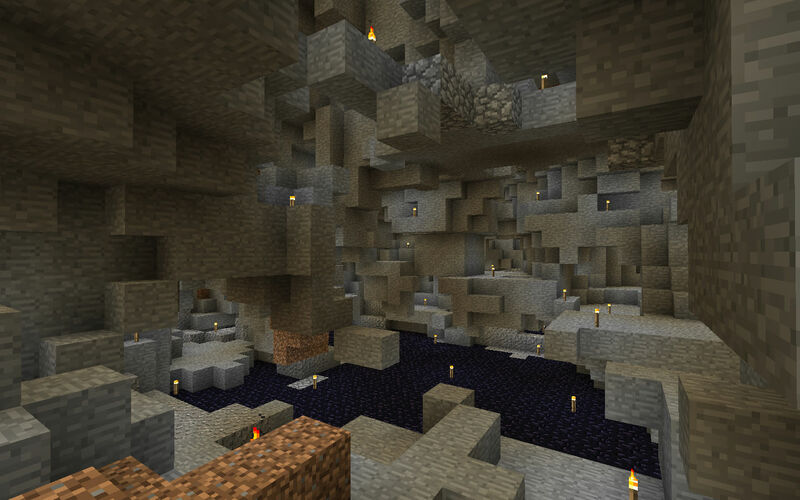 I decided never to mine any ore in that large cave, as I often do in a place of "natural wonder." 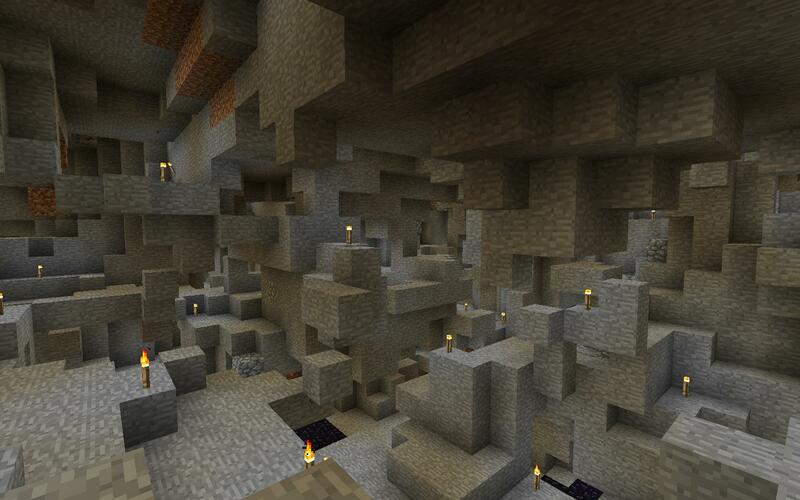 Once I decided to return, I stopped placing torches or mining any ore and drank a night vision potion. 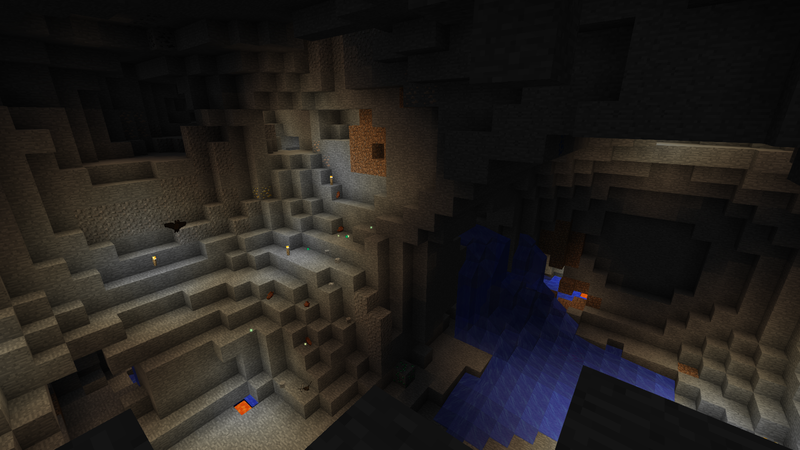 After a lot of exploration, I climbed upwards until I reached a dead end. I was about to either mine it out a little bit or turn around, but I heard a pig oink. I knew I was just below the surface—in fact, only about one layer of stone and three of dirt. 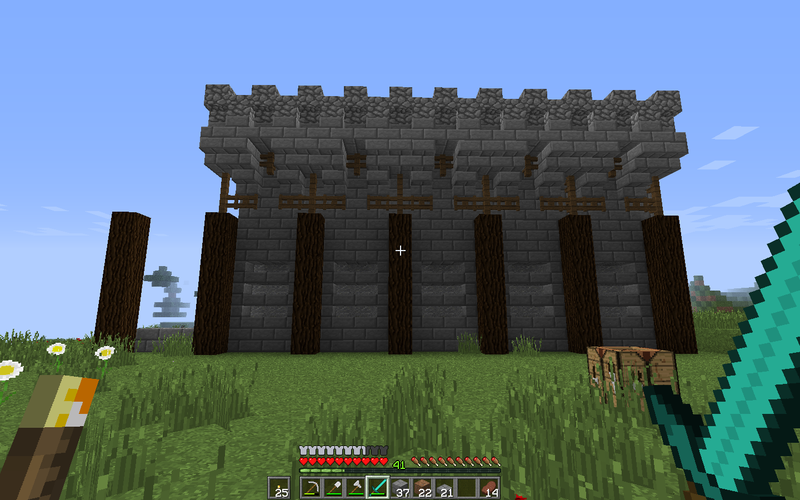 I emerged right to the south of the Guardian Mountains that ring two of Castle Midgard's sides. I couldn't believe I came up from a caving expedition so close to the castle, let alone such a good one. And, there's still so much more to explore! Of course, I don't know how many branches I have yet to light, but I know I left a ton behind after I drank that night vision potion. Took a few screenshots. 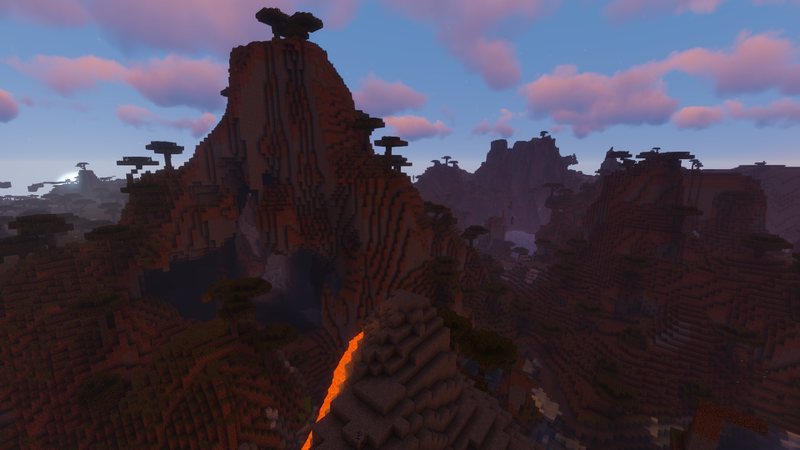 Sildur's Vibrant Shaders v1.164 Extreme. 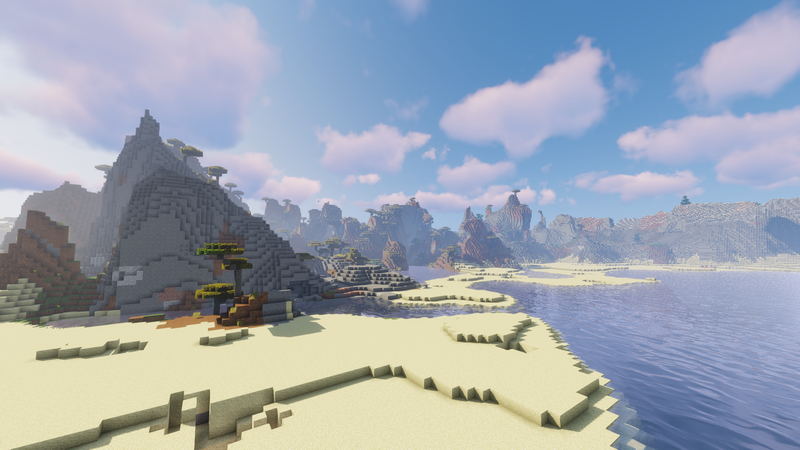 Render distance 32. Captions below images. (Above) Here is where I emerged, roughly, thanks to the help from Mr. Pig. 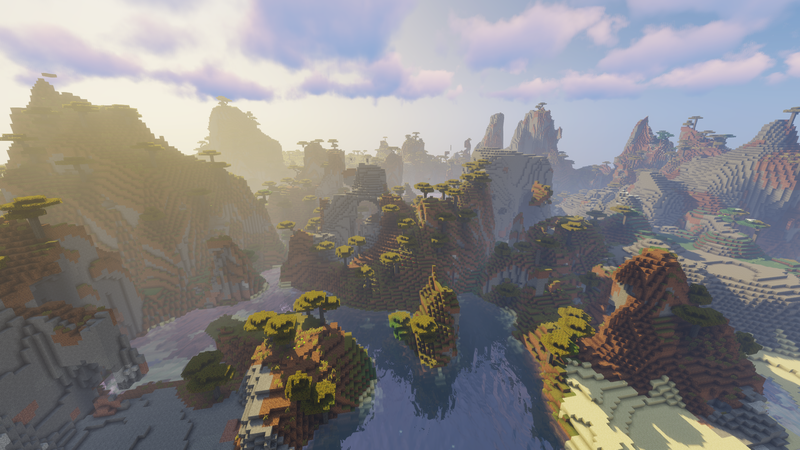 If it weren't for the shader not having fog, the tower would barely be visible as a silhouette at the edge of the 32-chunk render distance. (Above) Not much of a haul, but I wasn't down there to mine. 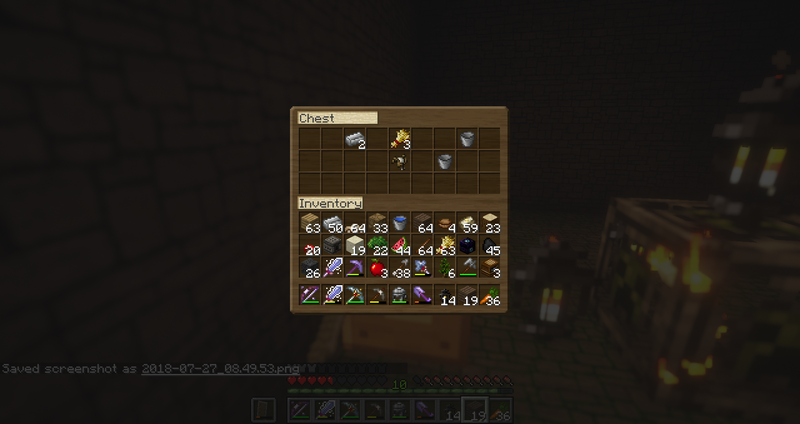 I'm really surprised I had a stack of iron. Still, I would have liked a few diamonds at least. I'm sure there are some down there. Lots of exploration left! 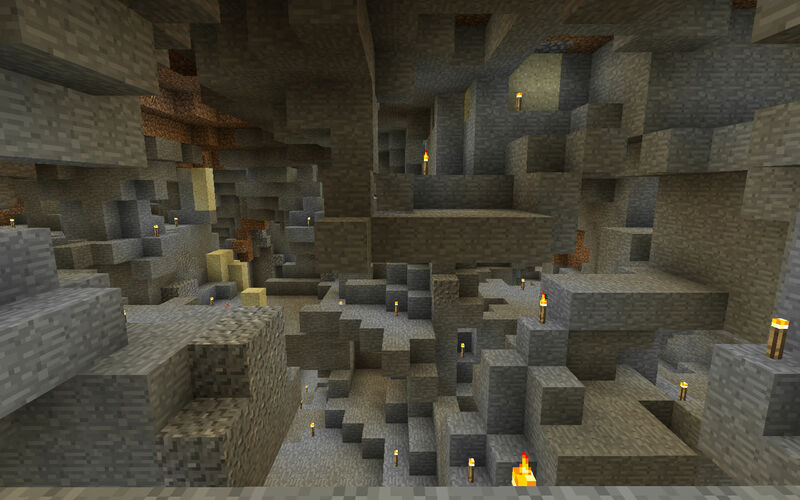 (Above) The ravine just south of the castle. For reference, notice the road to the entrance, the same in above pictures. 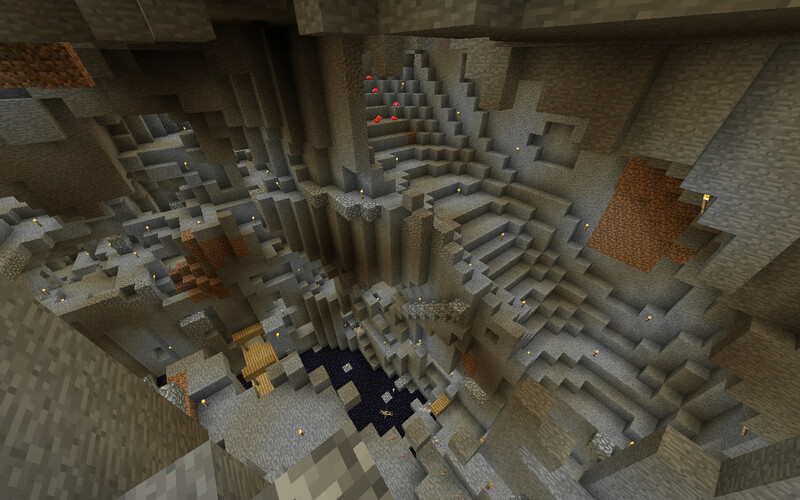 (Above) The hole in the bottom of the ravine drops down to about gold level, mid 20's. 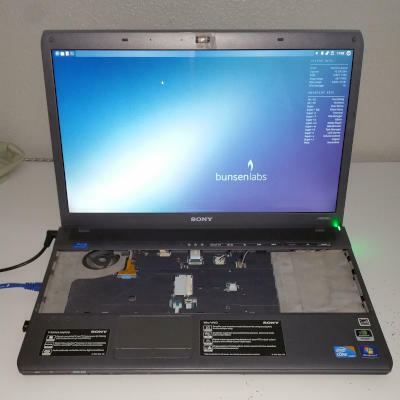 I resurrected the Broken Laptop server, and made a new skin. My attempts at getting a stable, well performing server for 1.13 on one of my tiny single board computers were disappointing. 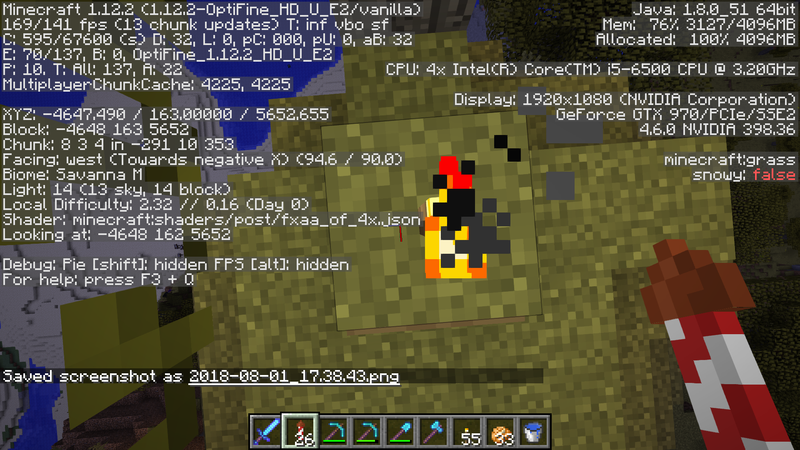 Not sure if it's just that Spigot has not been fully optimized yet (which is obviously true), or that the demands of 1.13 are just too much for the little computers. 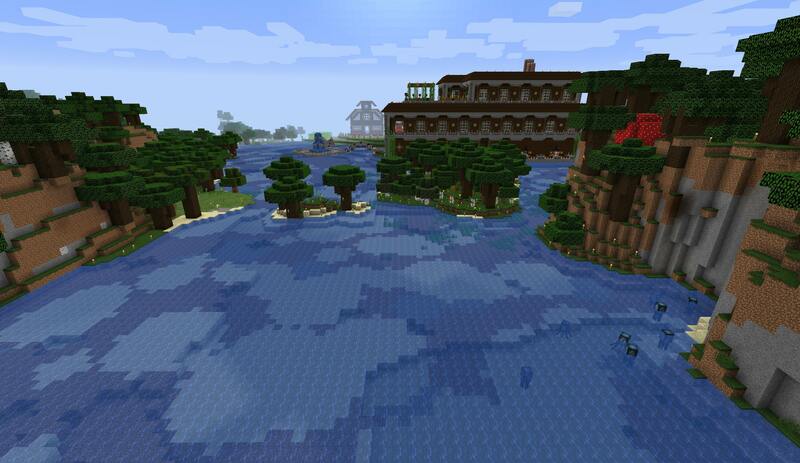 So my Raspberry Pi3 is once again hosting the Creeper Pie server with my 1.12.2 Mushroom Peninsula world. And the SpigotMC 1.13 "Extreme Caution" release server is running on an old Sony laptop, which is, in fact, broken. It has no keyboard, but since I run it headless that's fine. With only 2GB allocated to Java it is running very well, but I'll probably bump that up next time I do server maintenance (the system has 8GB installed). I installed the latest Bunsenlabs Linux "Helium" OS release with Oracle Java 8. Bunsenlabs Linux is a lightweight implementation of Debian GNU/Linux using the Openbox window manager and Tint2 panel, but no desktop. It's a very different user experience from Windows or traditional Desktop Linux implementations, but I like it! If that sounds familiar at all, it's because Bunsenlabs Linux is a fork of the abandoned Crunchbang Linux. And here's a closer look at the new skin idea I've been messing with. 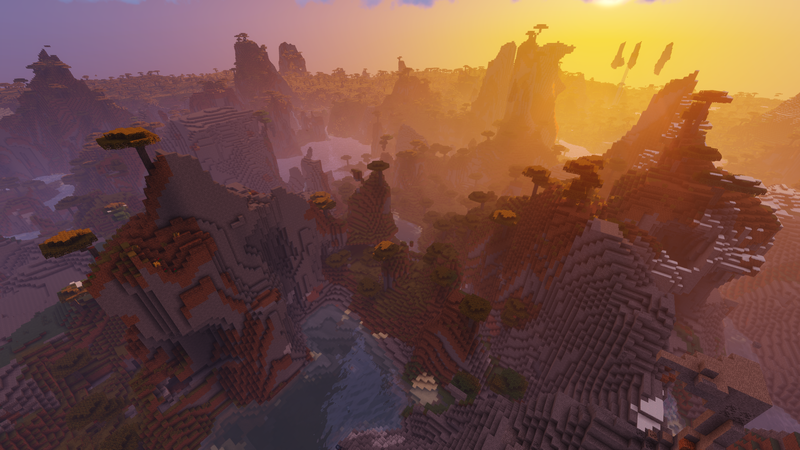 After a recent thread about the rare Savanna M biome, I thought I'd take a little trip down south to mine. 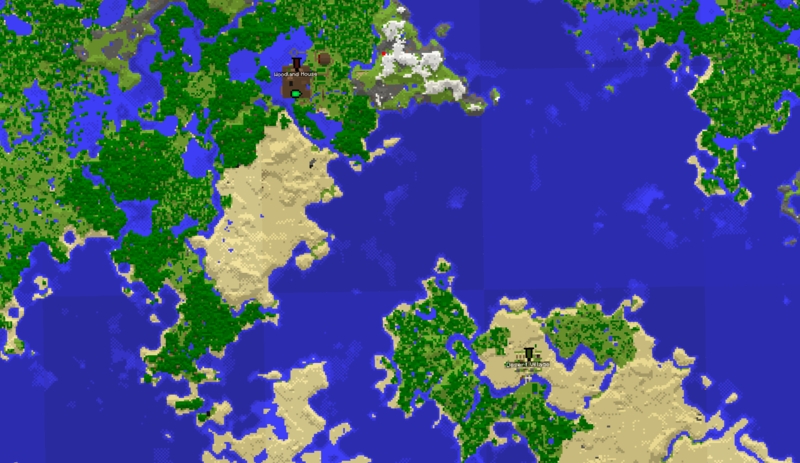 My large-biome world, "Midgard," has one at the very south-west edge of a 5x5 area fully-zoomed-out maps, the area I consider my "kingdom." 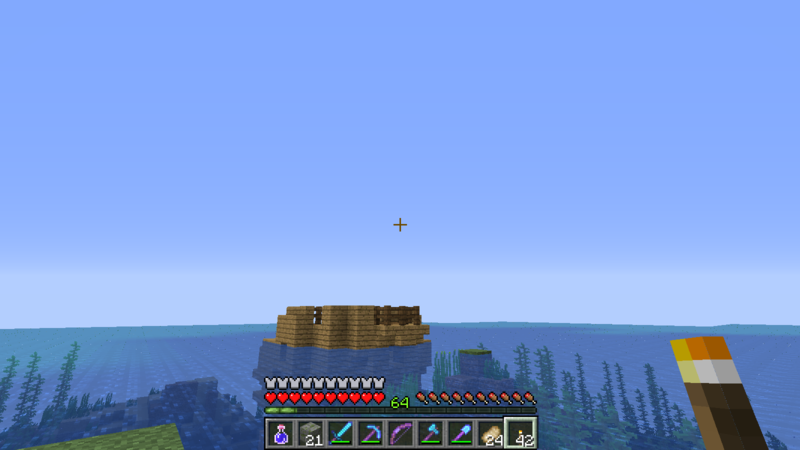 It's about 6.5 km from my main base as the elytra flies. Its highest peak is the highest point in Midgard: Y=163. I remember discovering it, Sept. 29, 2017. Quite a sight! It's also hard to take a good picture of it. 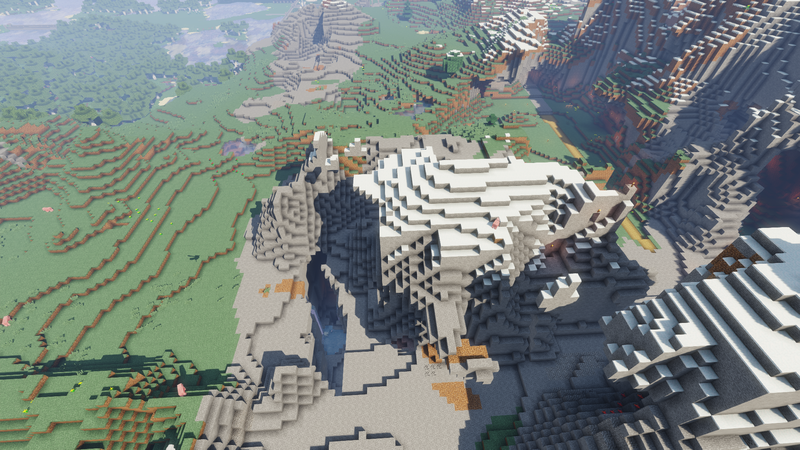 Of course, it's about 16 times larger than default, but it's not a very large biome, that's for sure. 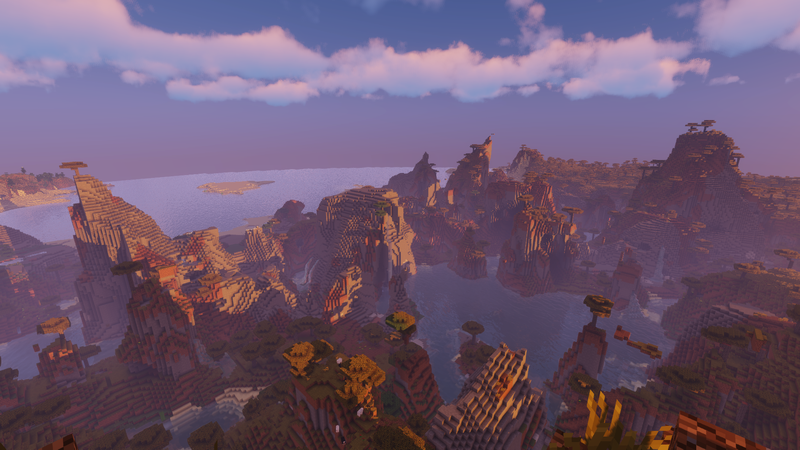 It might look really expansive to those who aren't accustomed to large-biome worlds, though. It's bordered by ocean to the south, a savanna on its west and extreme hills on its east. 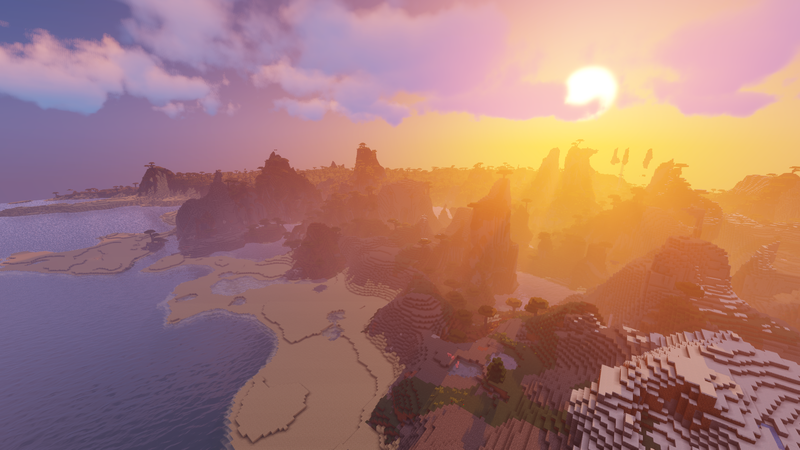 For these screenshots, I used Sildurs Vibrant Shaders v1.17 Extreme and increased render distance to 48, farther than the 32 the slider allows without OptiFine. I'm working on an Aquarium based off Birch Aquarium in San Diego. 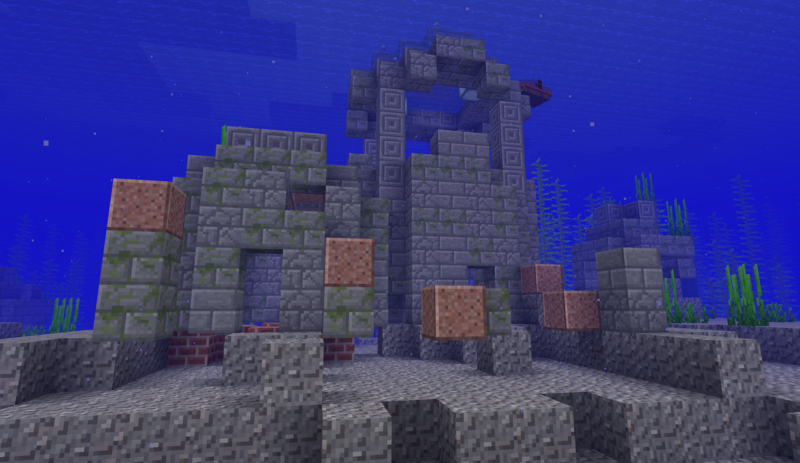 Seems like a logical build for the Aquatic Update. So far it is coming along great! Been at work thinking about how I am going to finish it. Can't wait to go home and spend a few hours on it! I should have pics soon that I will be posting on my thread once completed. Hello people. 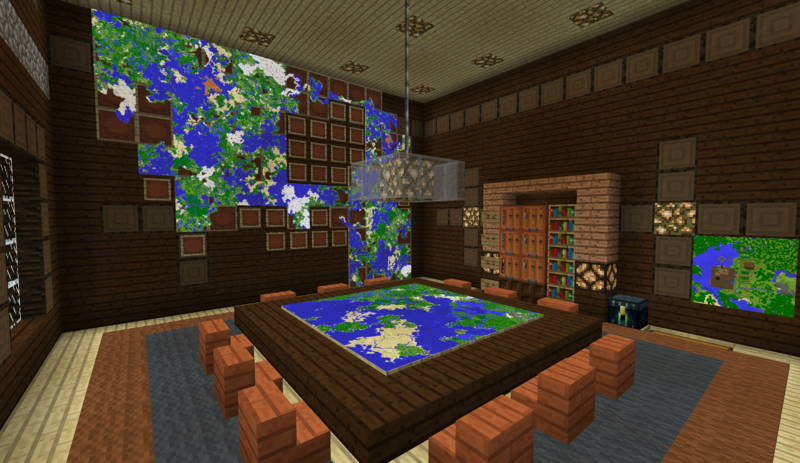 It is not my Survival, after a few years, I have managed to apply in an SMP. 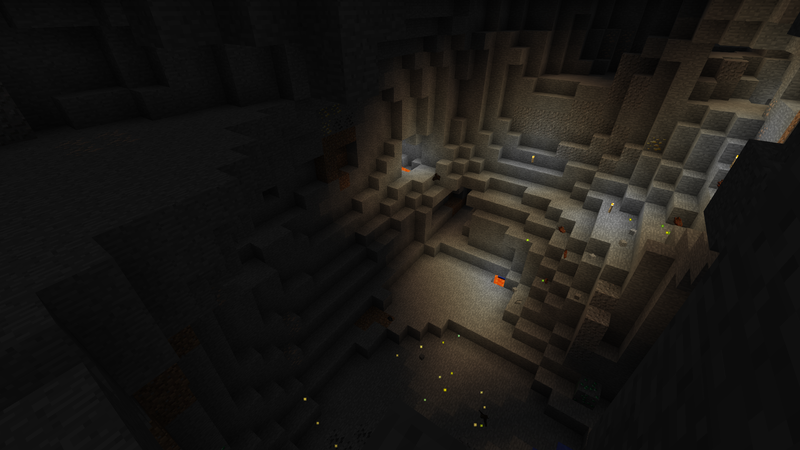 The first thing I have done is to enter a cave, after minutes we found a Dungeon. 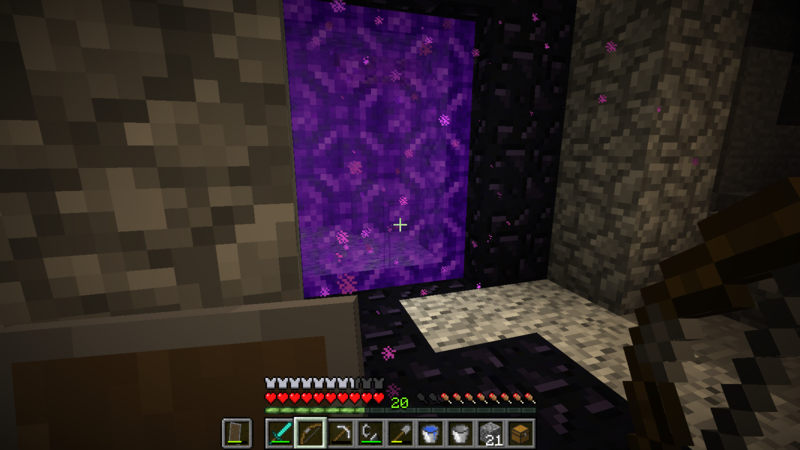 I also made the Nether portal, but do not enter there. I also got my first Rare Drop on the Server.